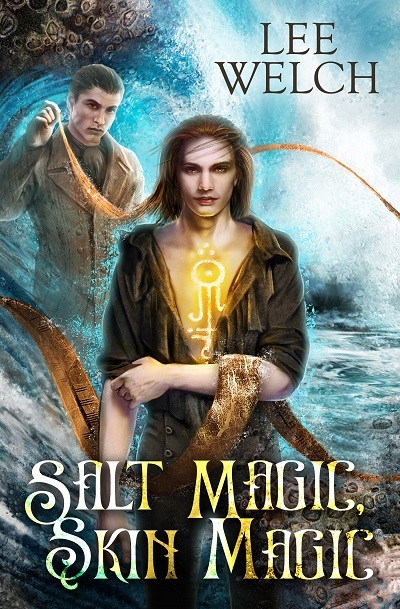 "Salt Magic, Skin Magic by Lee Welch is the sort of book you want to read again the moment you reach the end. Beautifully written, with a romance that is by turns sweet and scorching, it belongs on the keeper shelf of any lover of paranormal historical." Thornby was walking along the moorland path, calm as you please, nose in the air, apparently admiring the autumn colours in the distant oaks in the park. Thornby walked faster, slight limp becoming more pronounced. John felt in his pockets for his vials and pouches, then changed his mind and simply put on speed. He’d come to this remote part of the grounds in the hope of a rest. He’d not slept much last night with the walls of Raskelf muttering and whispering, and the antiquities from Egypt shrieking muffled curses from the other side of the corridor. The thought of Thornby had kept him awake as well; so resistant to the Judas Voice—that had given John an unpleasant moment—and so unapproachable, with that aristocratic hauteur you could never breach. And so strange. Why did the man wear such peculiar clothes? Today it was tight black pantaloons and a high stock that would have been fashionable forty years ago. And over this bizarre Regency costume was a rusty black greatcoat with wide cuffs, and a tricorn hat that would have looked well in the previous century. And, yes, Thornby was handsome—heart-stoppingly so—with arrogant grey eyes, a mane of brown hair that almost reached his collar, and a preposterous red mouth. He was tall and thin and carried himself like a fencer. There was, too, something whip-taut about him, some unbearable tension that made you feel he might lash out. Or suddenly kiss you. Thornby had looked John up and down when he was introduced, finally unbending so far as to give John a slight inclination of the head. And John’s mouth had gone as dry as if Thornby had extended one of those elegant white hands and given his balls a gentle squeeze. It was tiresome, really. It made it so much harder to concentrate. He must make sure he didn’t allow his attraction to the man to cloud his judgement. Possibly Thornby was using a glamour spell. John couldn’t sense one, but sometimes by their very nature they were difficult to detect. So, he mustn’t think about how good it would be to slide his fingers inside Thornby’s old black pantaloons, how good it would be to taste his lovely mouth, and wipe that damned snooty expression off his face. If John had been in London, he would have gone to one of the houses that catered to men of his taste, and tried to forget about it. Here in the middle of rural Yorkshire it was far too dangerous to approach anyone, and in any case, farm lads were not his type. He’d simply leave as soon as he could tell Catterall he’d done his best. They walked in single file for perhaps five minutes. The path smelt of rotting leaves, and a biting wind began to make its presence felt as they crossed into an open piece of moorland. Splashes of muddy water were spotting the back of Thornby’s coat. John used the close proximity to feel for magic. Like last night at dinner, he could sense nothing emanating from Thornby. There was certainly no demon reek, so Thornby probably wasn’t a theurgist, or if he was, he was a very fastidious one. But then Thornby didn’t feel like a materials man either, and John could generally recognise his own kind. So, how had Thornby broken those charms? Now John was closer, and had longer to concentrate on Thornby alone, he thought there might be something magical, at the very edge of his awareness, but he couldn’t put his finger on it. Most magicians used demons or materials, but there were other ways, so perhaps Thornby used some unfamiliar method. John charged his ward stone, and put it back in his pocket. He patted his bag of salt and checked his Gelomorous twine and the demon trap, just in case. Whatever spells Thornby cared to throw at him, he was ready. In fact, he was almost looking forward to a fight. They reached an open place a hundred yards from a small pine spinney. The dark trees were contorted sideways as if fleeing the icy wind. The sun, behind its grey pall of cloud, was beginning to set. Thornby suddenly stopped and swung around. “Well, Mr Blake? I suppose you’d like to explain yourself?” Thornby’s chin was up, beautiful mouth curved in disdain. Lee Welch wrote her first book aged seven (a pastiche of The Lion, the Witch and the Wardrobe) and first had an idea for an m/m romance aged twelve. She loves books and comics, and when she’s not writing, she’ll probably be reading. Her favourite authors include Ursula Le Guin, Graham Greene, Linda Medley, Dylan Horrocks and KJ Charles. By day, Lee works as an editor and business communications adviser, mainly persuading people not to say ‘utilise’ when they mean ‘use’. Her job has led her to work in areas as diverse as mental health, nursing, accident prevention and the criminal justice sector.